Last weekend Mr. FvF and I had to pick up a few things and knew since it was only 3p.m., dinner time would not come soon enough to keep our hongries at bay. We don't tend to keep much snack food in the house except for nuts and fruit, but that just wasn't going to cut it. Walgreens had their Cafe W frozen stuffs on sale for $2.50 each, in your usual assortment of appetizers, like pizza rolls, chicken wings and egg rolls. 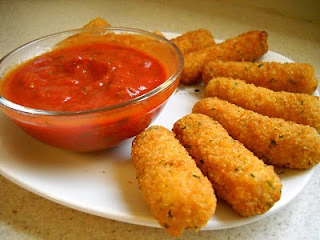 We grabbed the mozzarella stick, took them home and tossed them in the oven for about 10 minutes. The result: super tasty. The exact same stuff you'd find under the TGI Friday's name or any of the sort, which is basically the same stuff you'd get in any restaurant (except maybe Christopher's, whose cheese sticks are better than the average bear's). We used some of the Dei Fratelli Homestyle Marinara for dipping, which provided a nice, sweet opposition to the seasonings in the breading. A++, would put into face again. They even look like restaurant cheese sticks - wow! And, trust me, I *know* my cheesesticks. Free fries at Penn Station! 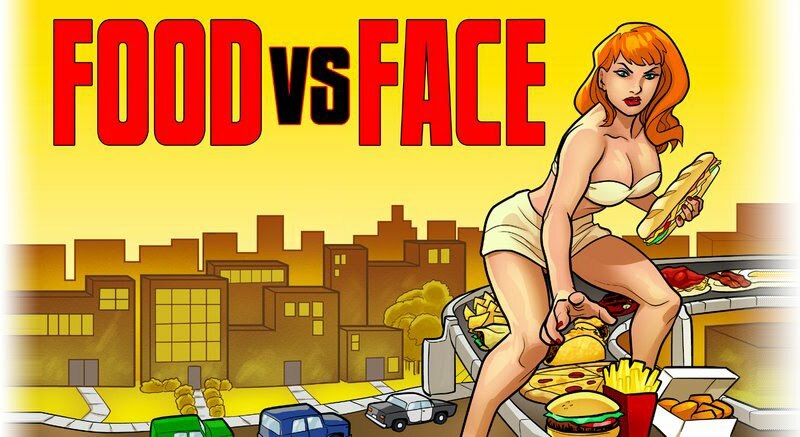 Will the real Food vs. Face please stand up?